The fully upgradeable EUROCOM Sky X9W is equipped with the most powerful Intel Processors up to Intel Core i7 6700K accompanied by 64 GB DDR4 memory, 5 TB Solid State storage and professional graphics up to NVIDIA Quadro M5000M powering an exquisite 17.3” 4K Ultra HD display. The EUROCOM Sky X9W, the world’s best 17.3-inch mobile workstation, enabling audio/video editors, graphic designers, engineers and other high-end power users to create like never before with unmatched portability, blazing power and reliable performance. Eurocom responded by incorporating new features into its flagship mobile workstation, adding a 4K display option, Thunderbolt™ 3 technology and super-fast PCIe Gen 3 X4 storage. Eurocom developed the Sky X9W to be a mobile supercomputing powerhouse for simulation, ray trace rendering, mobile analytics, CAD, CAE, server operations, software development, GIS on the go and so much more; while being a long term, stable system. Supporting the most powerful mobile professional graphics solutions including the NVIDIA Quadro M5000M, M3000M and M1000M, desktop 6th generation Intel Core i7 processors in the EUROCOM Sky X9W ensures the ability to run the most demanding engineering and design software with ease, while on the go. 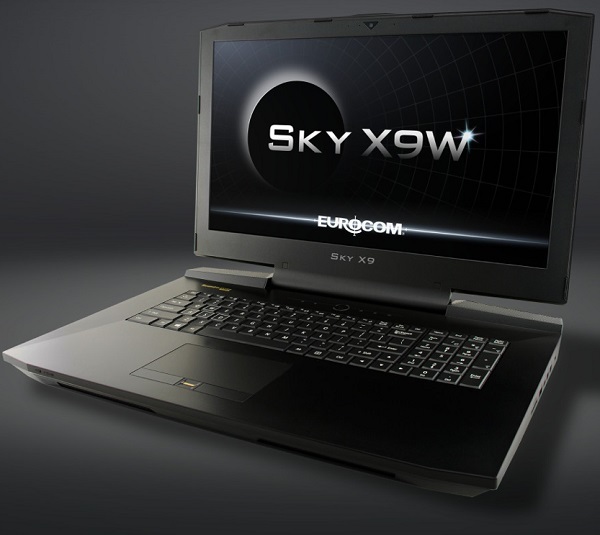 The EUROCOM Sky X9W is fully configurable and upgradeable allowing users to choose the perfect blend of performance and price point during purchase and through the systems entire life span. Professional graphics capability is supported through upgradeable MXM graphics interface up to NVIDIA Quadro M5000M with 8 GB GDDR5 or M3000M with 4 GB GDDR5 or M1000M with 2 GB GDDR5 for the ultimate graphics capability on the go. To display the exquisite graphics supported in the Sky X9W we fitted it with a high pixel density 4K Ultra HD matte IPS display with a whopping 8,294,400 pixels for beautiful visuals. When working at the 4K resolutions of the Sky X9W, memory and storage performance are key, this is why Eurocom spared no options with 64 GB DDR4 support and super-fast M.2 NVMe SSD availability combined with two more SATA3 HDD or SSD for large capacity drives. Eurocom recognizes our customers are using Mobile Workstations for mission critical applications and projects that are extremely important, because of this we equipped the Sky X9W with Trusted Platform 2.0 module, Fingerprint and Kensington lock to guard the data that our users value. RAID 1 is offered to protect user’s data by making an exact copy on a secondary hard drive.